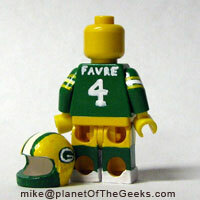 I put this together for someone at work who’s a huge Favre fan. 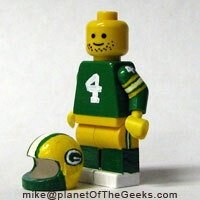 To be honest, I’m not very happy with the helmet, specifically the face mask. I had tried slicing the chin piece in half on another helmet, to make it look like the bars of the face mask but it didn’t really come out right. Maybe on the next one I will cut the chin piece off entirely and make it out of wire. 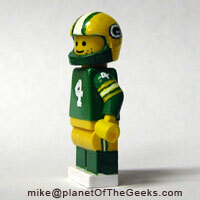 I did a lot of googlage before starting this project, and I haven’t been able to find another customizer who’s made a minifig football helmet, which is pretty surprising. Maybe one of the knockoffs like MegaBlok or Best-Lock makes one.